The World Bank Group held its 7th Global Housing Finance Conference on May 25-26, 2016. Jointly hosted biannually by the World Bank and the International Finance Corporation (IFC), the underlying theme of the conference is based around the new Sustainable Development Goals (SDGs), particularly Goal 11 which focuses on sustainable cities and communities. The conference will explore innovative ideas on how to ensure access for all to adequate, safe and affordable housing and basic services. As in previous years, the conference attracts an audience of officials, practitioners, NGOs and donors from the developed countries and emerging markets. Its principal aim is to exchange views and experiences, and derive key operational conclusions for policy makers and housing finance practitioners. The conference creates awareness of the major challenges in developing or strengthening housing finance markets and seeks cooperation for better solutions. Pre-conference sessions will be held on Tuesday, May 24 to delve deeper into specific topics and facilitate a broader discussion. These sessions will cover housing microfinance, mortgage lending in emerging markets, and the housing sector in sub-Saharan Africa. Attendance of these sessions is limited to conference participants only and will be on a first-come-first-served basis. Click the link below to register for any/all of these sessions. For any questions, please contact the World Bank Housing Finance Team: housingfinance@worldbank.org. Note: Click session names to access presentations. Is the 2030 Sustainable Development Goal realistic and achievable? What needs to happen to make it a reality? What role will Housing Finance play in harnessing the investment necessary to build the cities and the decent affordable housing which will be needed over next 14 years and beyond? Can the goal be reached? What needs to change? Sub-Saharan Africa faces a population and urbanization challenge over coming decades which is unparalleled across the World. It requires millions of new houses and trillions in investment. What are the pioneering programs being adopted to create the new housing stock? How can governments respond to the needs of those most vulnerable and on lowest incomes? How can housing help create vibrant African cities? Emerging Markets face a common challenge of lending to those at the bottom of the pyramid who are on low incomes and/or work in the informal sector. What is the latest thinking in adapting existing models to fit these challenges? What role should government take in providing a housing safety net? Is homeownership the best solution for those on lowest incomes? How can lenders underwrite loans for those working in the informal sector? Accessing long term funds remains among the biggest challenges in developing housing finance in emerging markets. What has been experience with different financial instruments ranging from covered bonds, MBS and mortgage liquidity facilities? In the post-subprime era, how do new regulations impact funding? What will the Basel III Net Stable funding Ratio mean for lenders? What is future role of securitization? 9:45 – 11:00 Session 5: What role for private sector in reaching Housing 2030 Goal? The scale of the investment required will necessitate a strong private sector expansion in many markets to plug the housing investment shortfall. What are the implications for lenders in terms of risk management, funding? What are the new business models? How can ICT be harnessed for housing finance? Can international capital flows provide investment returns and new housing stock? 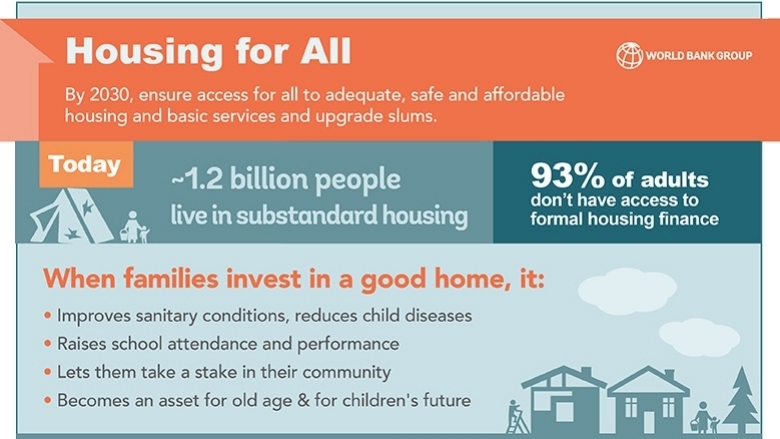 Housing access for all by 2030 will not be achieved if some segments of the population remain excluded and deprived with access to adequate land and housing. This session will bring a variety of perspectives on policies and actions needed to address affordable housing challenges for those excluded due to tenure, race, ethnicity, or gender. Alastair Parvin is an architectural and strategic designer and co- founder of the WikiHouse project work which aims to bring access to housing to all through 3D printing of housing assembly kits. His work looks beyond the conventional framework for architecture, looking at the economic, financial, social, political and technological operating systems behind it. Housing displaced population – either due to conflicts or large scale natural disasters – has become one of the most urgent development issues in many parts of the world. New solutions are required to provide temporary and permanent housing for displaced people at short notice, in contexts of limited capacity and unclear property rights, while at the same time, avoiding increased pressure on low-income housing in hosting communities. Are there successful stories? What are the financing implications? What role the humanitarian community, governments and the private sector should play respectively? The challenge of delivering housing for all by 2030 calls for a holistic understanding of the housing value chain (formal & informal). An efficient housing system requires full alignment of the supply side (planning regulations, access to land, infrastructure, developer finance, construction, and building materials) and the demand side (end user finance) aspects of the sector. It also calls for coordinated actions across the national and local governments, the private sector, and the communities themselves. This session will bring together different perspectives from stakeholders to discuss where change is needed to make Housing for all by 2030 a reality. Location: Preston Auditorium - World Bank Headquarters - Washington, D.C.
Watch the event and participate in the discussion on World Bank Live.